You might be searching for how to increase battery life of laptop? If yes I have made this step by step guide to help you guys to increase the battery life of a laptop. The battery is the main asset of a laptop. But as it is usually only a few hours, we often seek ways to optimize to extend this precious time of use. 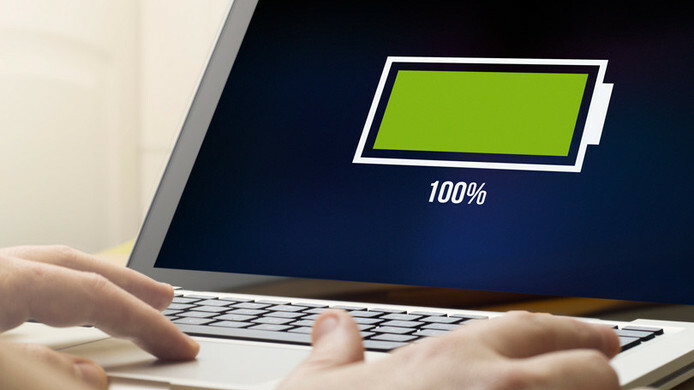 Here are some tips and tricks to increase the battery life of your laptop. Modern laptops are more powerful than ever, and thanks to advance nomadic technology, they are also more efficient, giving us a greater battery performance. However, they still need to be plugged in at a certain time of the day. Although self-sufficiency is the number one complaint about laptops, it is possible to achieve significant improvement by adopting good habits and a few software adjustments. The battery of the laptop varies according to the intensity of its use. The first reflex to have is to disable wireless connections (wifi, Bluetooth) when they are not in use. These last ones are very energy-consuming and will drastically reduce your autonomy. It’s the same for video games. The newest laptops are equipped with management software to save battery power. So remember to see the power settings. Enable the option to stop hard disks when not in use. The screen is one of the most greedy elements of your laptop battery. Keeping your display clear and bright requires a great deal of energy. To save money, simply lower the brightness. The brightness button on the screen is usually located at a secondary function of one of the F keys and represented by a small sun with up and down icons. To use it, hold the appropriate function key and choose up or down. By limiting the various functions of the laptop, you allow it to focus its forces on the essential. The goal is to limit, as much as possible, battery consumption. Windows 10 has very good power options that allow you to get the best performance from your notebook when plugged in, as well as maximize battery life. Type “power options” in the Start menu search box and choose “Power Save” from the list. Windows 10 also has other methods to save battery life, including settings to turn off the screen and go to sleep more quickly. Do not exceed a critical threshold of unloading (10% of remaining energy) or lose up to 20% of the battery capacity. Avoid exposing a battery to extreme temperatures. Indeed, heat and cold accelerate the deterioration of its chemical components. Keep it at a temperature around 15 °. Did you know that playing movies, songs directly from the DVD player use more battery life? It is best to copy/paste your files to your desktop to reduce access to power-consuming drives. Lowering the frequency of the processor through the software Downclocking makes it possible to increase the battery of a laptop at the expense of the performance. Finally, concerning software specialized in power management, we recommend “Laptop Hardware Control”. It is simple and complete. Many ways have been developed to improve the battery life of laptops. Some solutions are terribly effective while others are controversial. One of the biggest hoarders of your battery is the wireless network card built into most laptops. Wi-Fi drains the battery using it constantly and, when it is not connected, looking for networks. When you use your mobile phone away from the grid, it is likely that you are also far from wireless networks, so you can disable this component. Many laptops have a function button that allows you to manually disable the wireless adapter to prevent unnecessary loss of battery life, but older laptops often lack it. Open the Notification Center by clicking the speech bubble icon on the far right of the task bar, and click “Wi-Fi” to turn it off. Using USB devices can drain your battery life because your motherboard has to power them, so unplugging them saves energy. USB sticks, mice and webcams are the main culprits, so copy all your data, eject your devices as soon as possible and leave your mouse for the touchpad of your mobile. Many computers have function keys to disable the built-in webcam, which consumes battery when given the opportunity. And if you do not need sound, mute your speakers – the fact that your phone beeps at every voice it receives an email or that Windows starts can eventually impact the battery life. In terms of battery life, good accessories can do a lot, but if you want to make your laptop last a whole day, you will need help. Most laptops have a six-cell battery, but many manufacturers offer optional eight or even twelve-cell batteries, which can double your battery life. Portable chargers, an alternative to expensive mobile batteries, give you extra hours of use for all your devices. These are usually compact batteries that have adapters for most laptops and mobile phones. They are portable enough to be placed in a bag and their capacity is sufficient to double the duration of your autonomy. Windows 10 has some very convenient built-in features, but many of them put your system heavily on the back while being useless. By taking the simple step of turning off graphics effects while on the go, you’ll make your laptop more efficient. Lithium-Ion batteries do not need to be completely discharged (contrary to popular belief) but, once a battery is charged, you should use it. If you have a spare battery that you keep charged, use it regularly instead of your main battery. If you have an older non-Lithium-Ion battery, you will need to discharge it regularly. Do you have any other tips for making your laptop battery last longer?